Karelahills - Value Pack 700 capsules - Healthy Blood SugarKarela is a traditional fruit considered to help maintaining healthy blood sugar level - Each capsule contains 200 mg Karela Powder and 250 mg of extract (as dry extract) from Karela Fruit (Momordica charantia) (10:1) (equivalent to 2500 mg of Karela fruit). When assayed these tablets contain Bitter NLT 2%. - Ayurveda describes Karela to be a bitter tonic to be useful in the management of Diabetes. It has also been backed by modern scientific research. 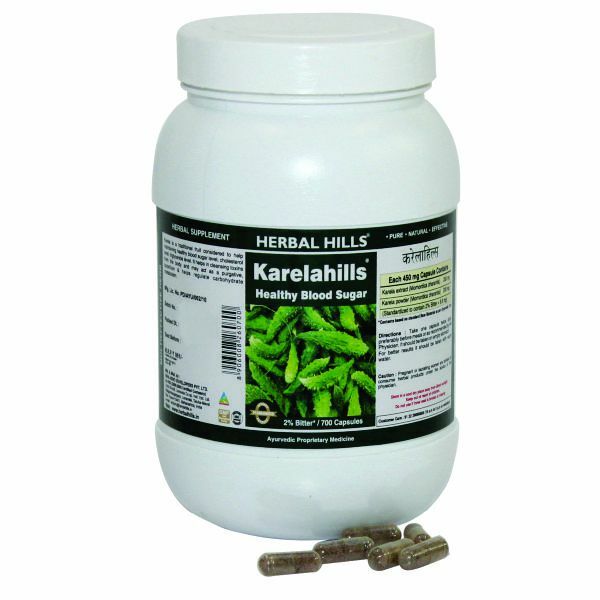 Karela helps to improve the cellular functions of the pancreas. Additionally Karela is also beneficial in controlling blood lipid (Cholesterol levels)Benefits : - Helps maintain normal Blood and Urine Sugar levels - Helps to regulate carbohydrate metabolism - Acts as a Bitter tonic - which helps to purify blood.